I was driving by my neighbor’s house when I saw this little cutie sitting on the street to be picked up by the garbage men. Wha-what?!? I put on the brakes, backed the car up and threw this baby in the backseat. She had a few issues I needed to fix. 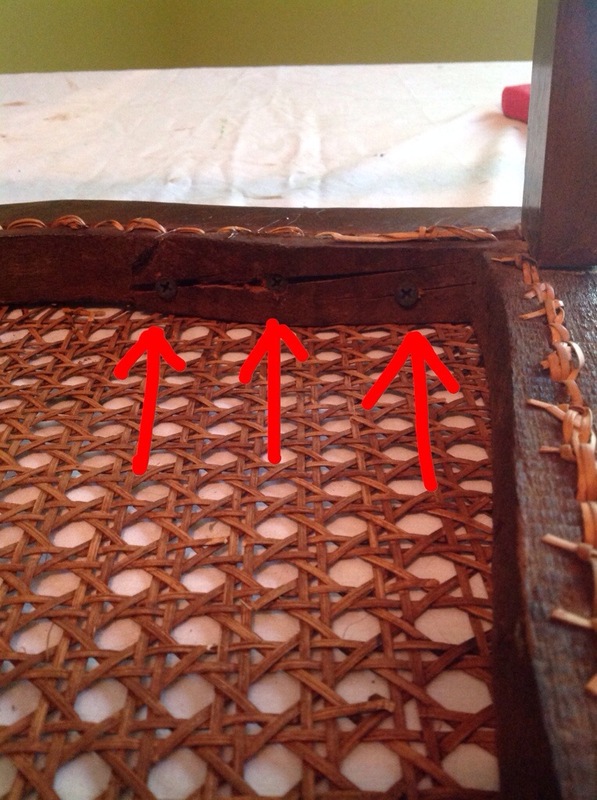 First there was this long crack along the front of the seat. Secondly, the cane was coming loose. 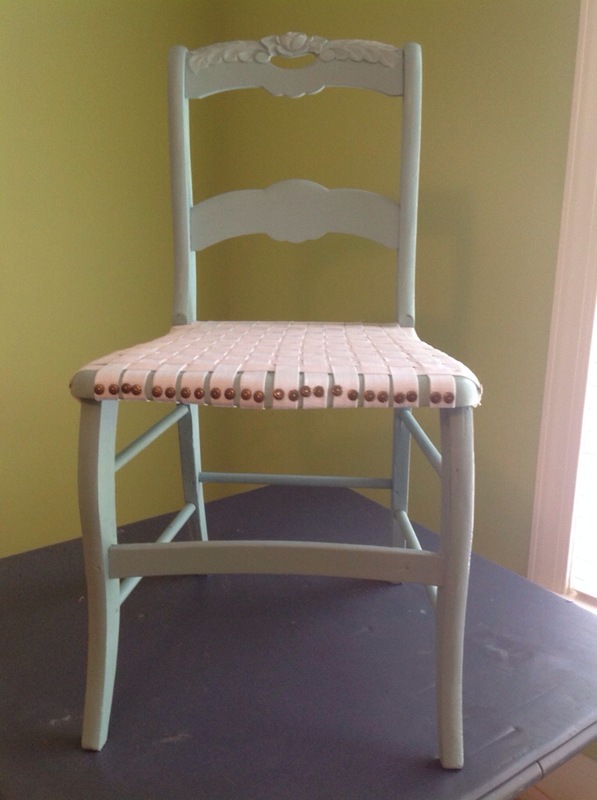 Thirdly, I felt like she needed a coat of paint. Because I am 1. Completely impatient and 2. Without a clue…I grabbed whatever I thought would help repair the front. E8000? Sure! That looks good! 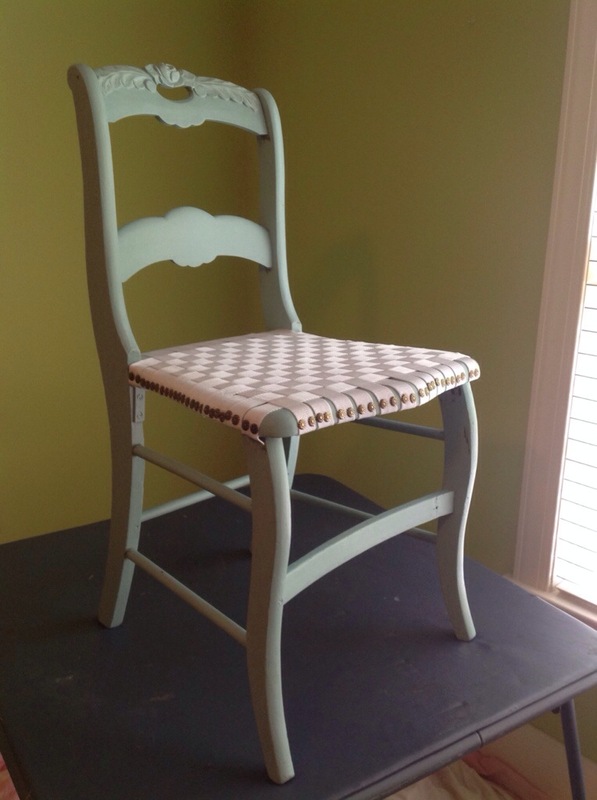 I added some blue paint from my dining room to a bit of the chalk paint I used in Mary Claire’s bedroom redo. 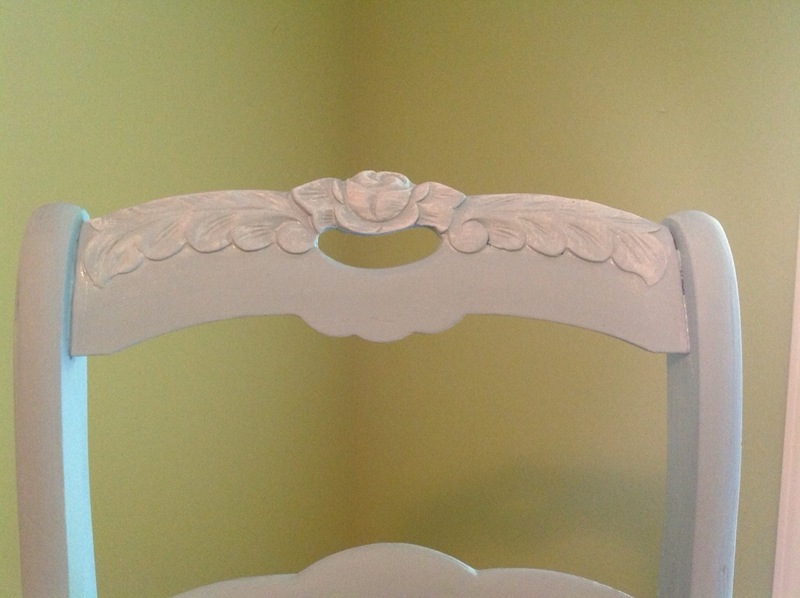 I dry brushed the top of the chair to highlight the flowers. 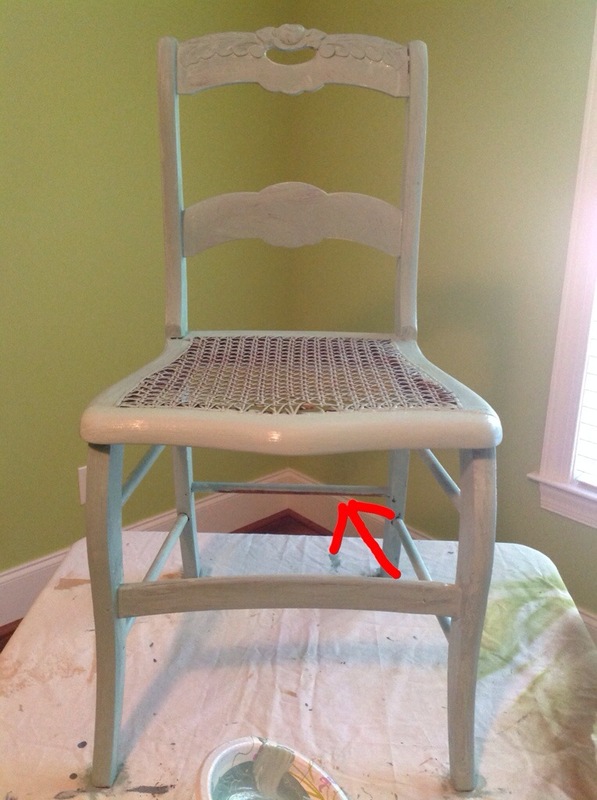 The key here is to use very, very little paint. 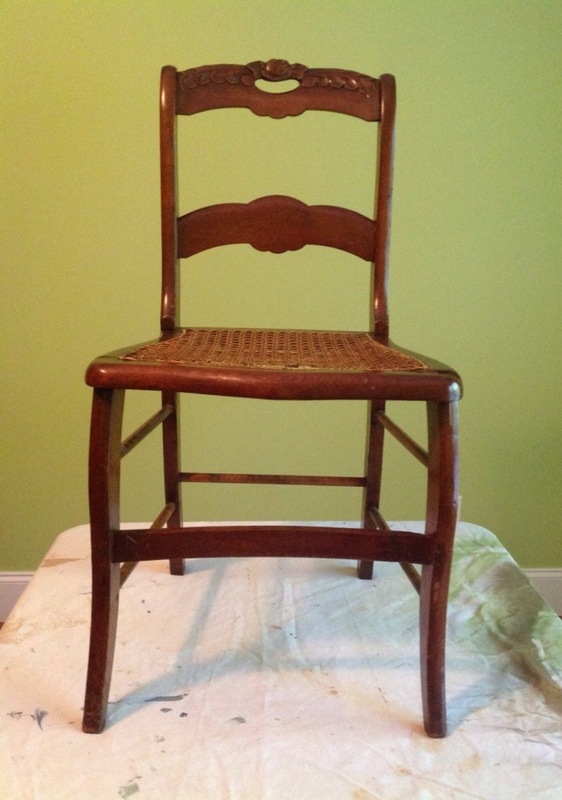 Barely tap the brush in the paint, then swirl the brush around on a paper towel before stroking on piece. 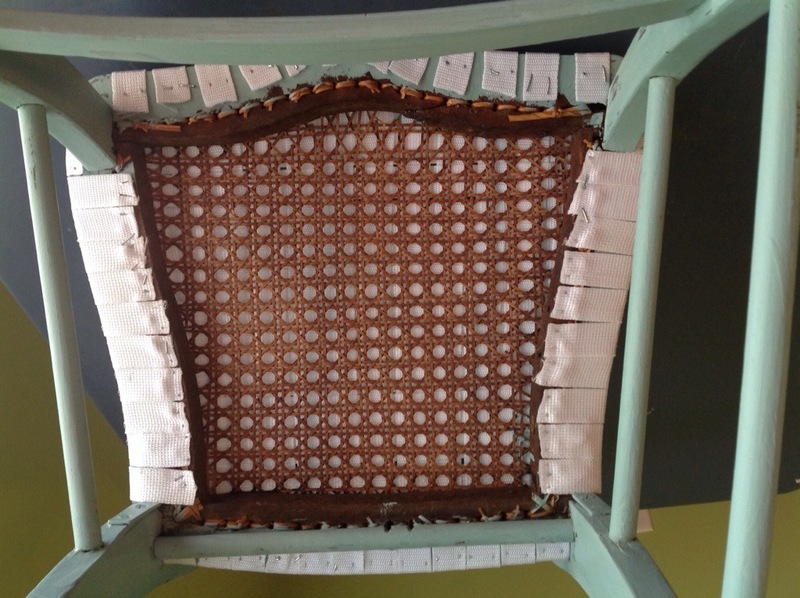 One should use a staple gun for attaching the webbing to the chair. Because I am not only impatient, I am also very messy! Things don’t always get put back where they should, so I waste sooo much time looking for things. I couldn’t find the staple gun. 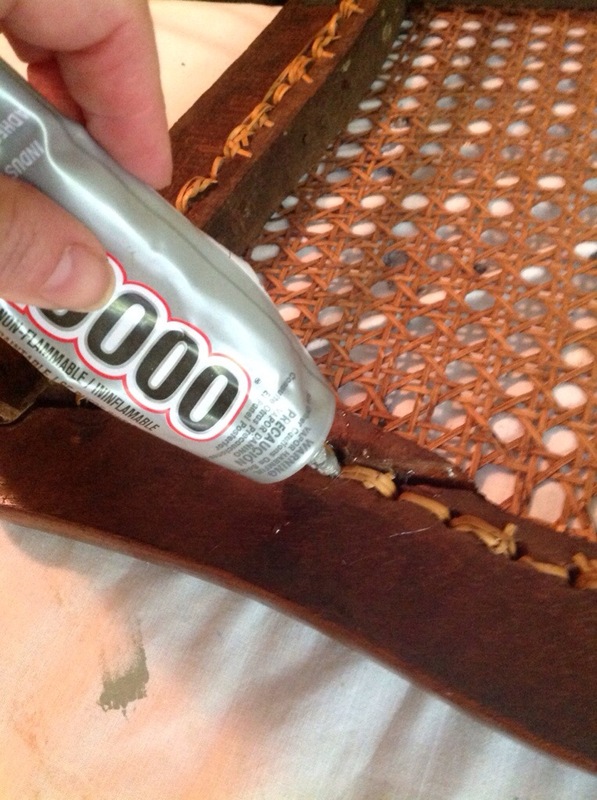 I used the next best thing glue gun hammer and nails. 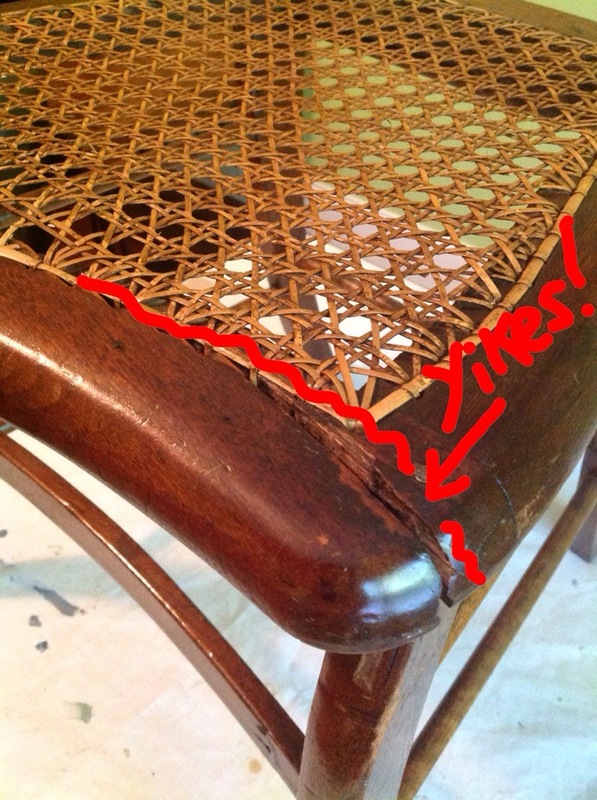 (I wish I could have used a glue gun!) I hate to think that my hammering skills are so bad, so the excuse for the bottom looking so bad is because…umm….the hammer got really heavy, the wood was really, really hard and … Ummm, the space to hammer was so small. (Are you buying it? Naah…me either.) I’m just bad at hammering. That’s why half of the nails are bent and sticking out everywhere. 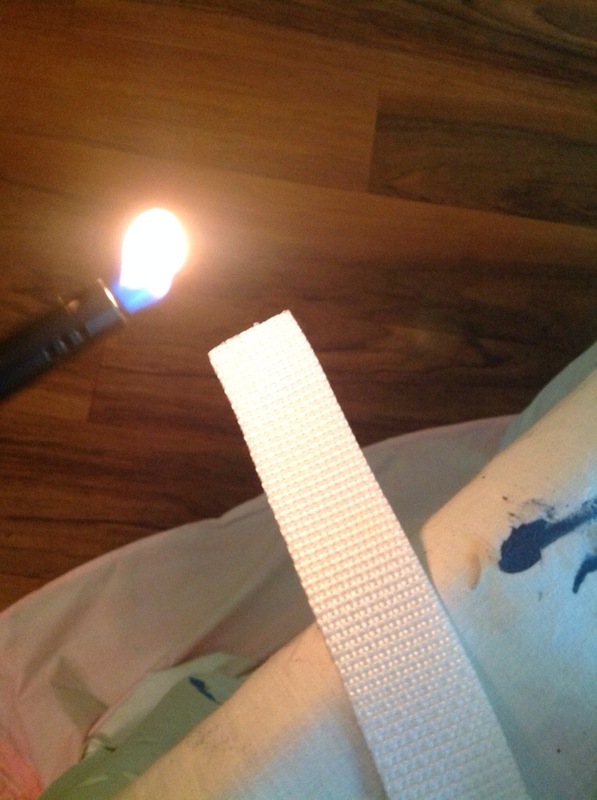 I think I’ll hot glue some ribbon over the nails to make it look pretty. Good thing this is all underneath the seat. 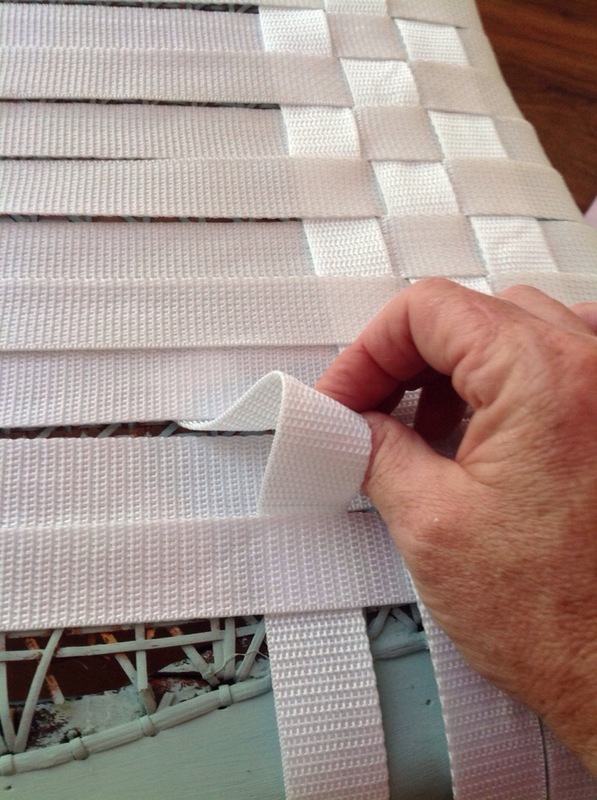 Do you know how to keep the nylon ends from fraying? Put a little flame to the ends! 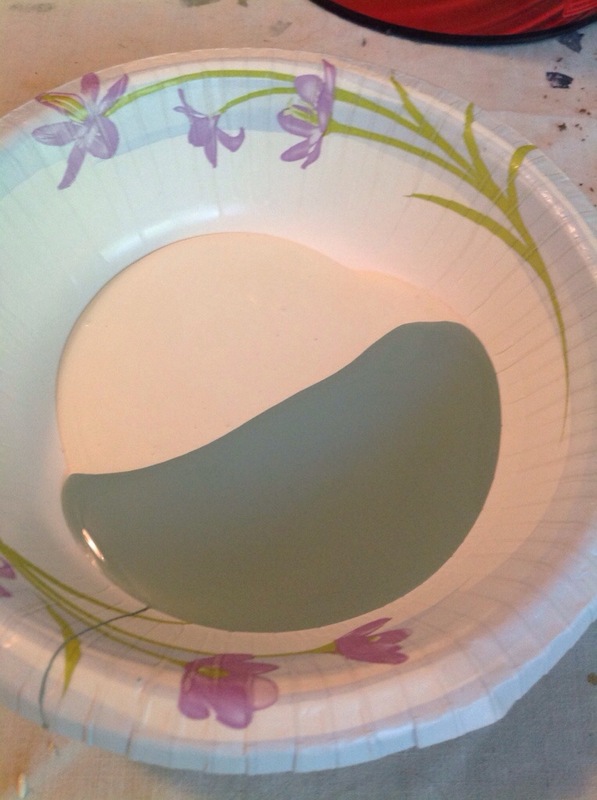 It melts the threads together perfectly. 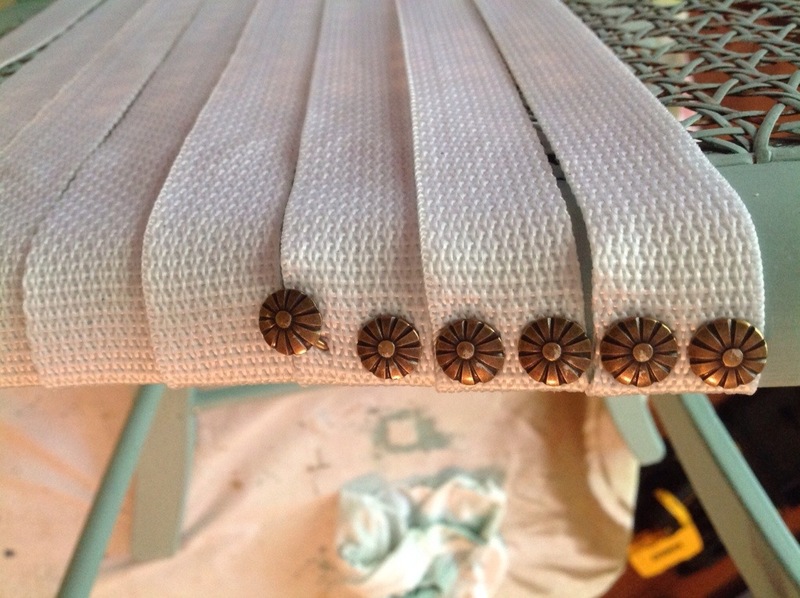 Lastly, I nailed decorative trim around the sides of the chair seat. Again, my hammering skills were getting on my nerves. I can’t tell you how many tacks I ruined by hammering them into a bent shape. I was getting a bit worried that I wasn’t going to have enough tacks, so I went back to the store to buy more, only to discover they had one pack left. Ugh. I really had to be more careful. Well, it turned out I had just enough. Because I was hammering away on an old, wonky card table, every time I pounded down everything on the table went flying around. When I stopped and sorta cleaned up a bit, I noticed a few tacks had bounced to the floor and I even had one lodged in the bottom of my shoe. Those few extras were perfect for replacing the tacks I had put in crooked and out of line. I think she looks right purty! Hopefully she will be strong enough for an adult to sit in. 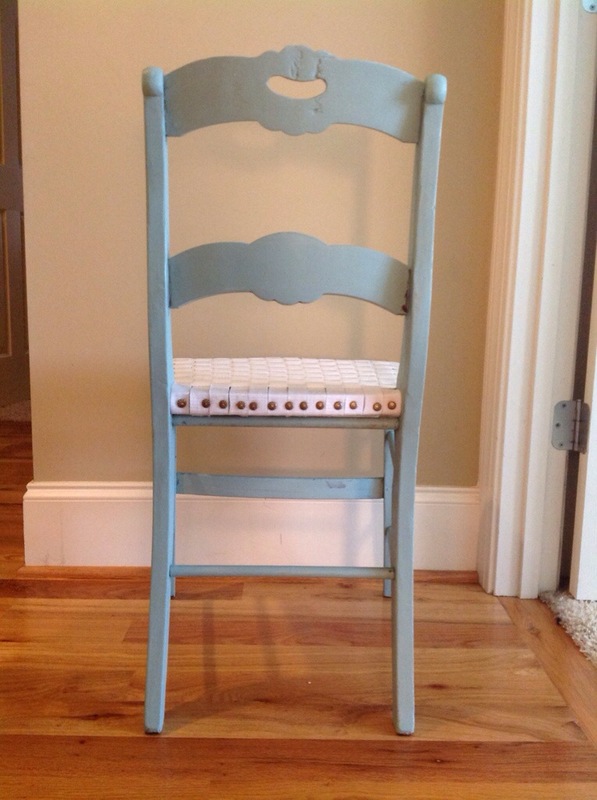 She will be moving into Mary Claire’s new home in Charleston. If you know me, you know how much I love getting all cutsie when it comes to having a party. I loved pulling together this tennis party. My tennis team was celebrating being league champions in our area and looking forward to competing at the state level. 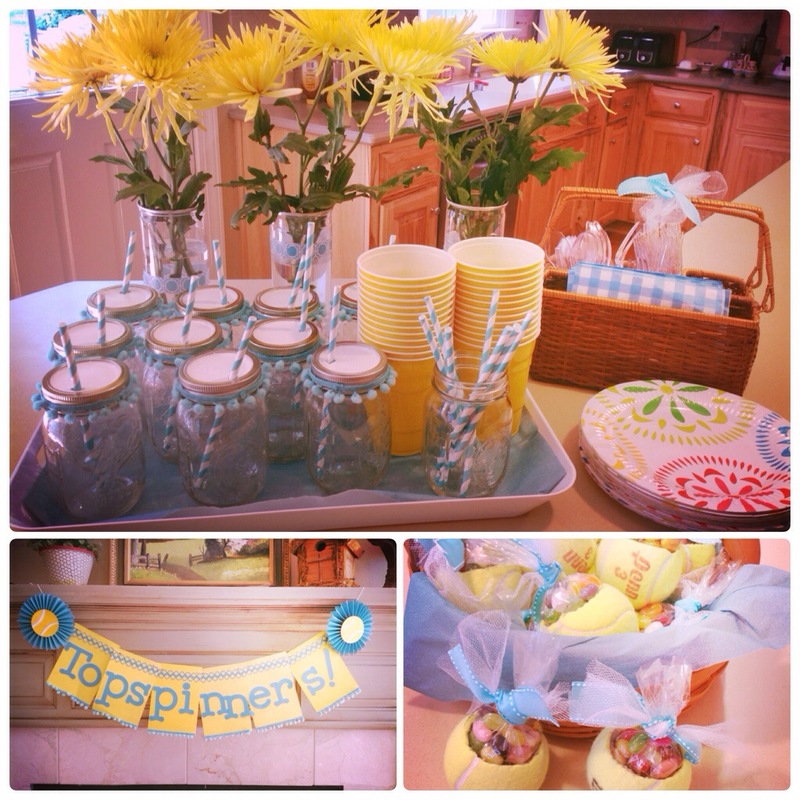 I had so much fun pulling together the coordinating colors, Pom Pom mason jars, a team banner and tennis ball sersies. This is something I enjoy doing, but it isn’t always necessary for a “successful” gathering. 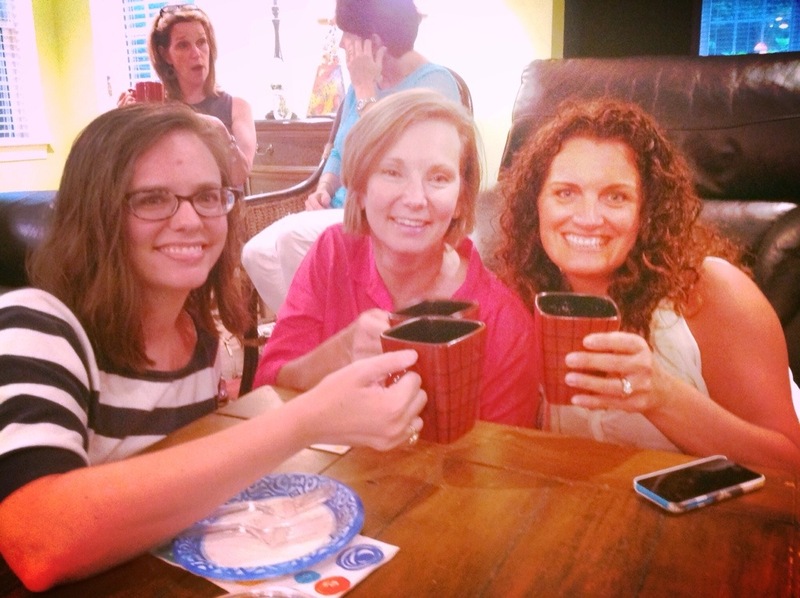 You’ve read about me feeling led to bring the women of my church together. 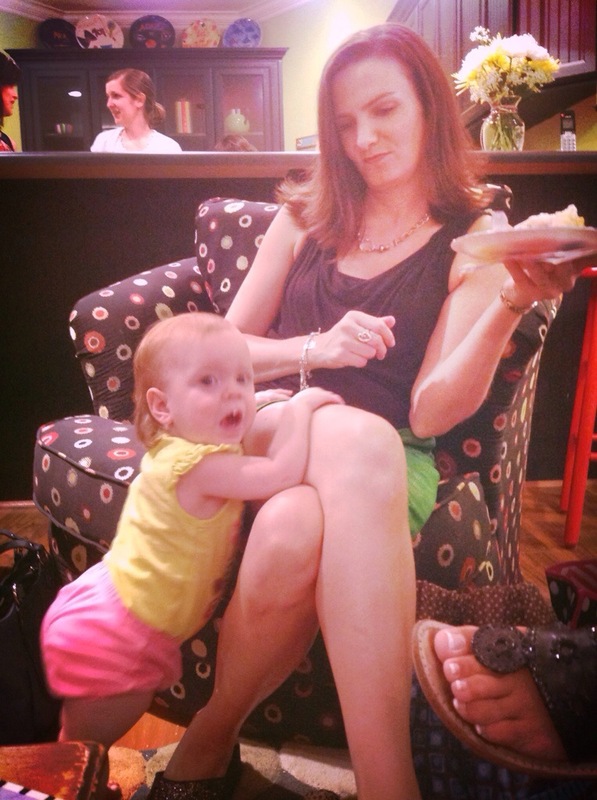 In fact, the last time I wrote a post, I told you about two small spontaneous gatherings we had at Barnes & Noble. 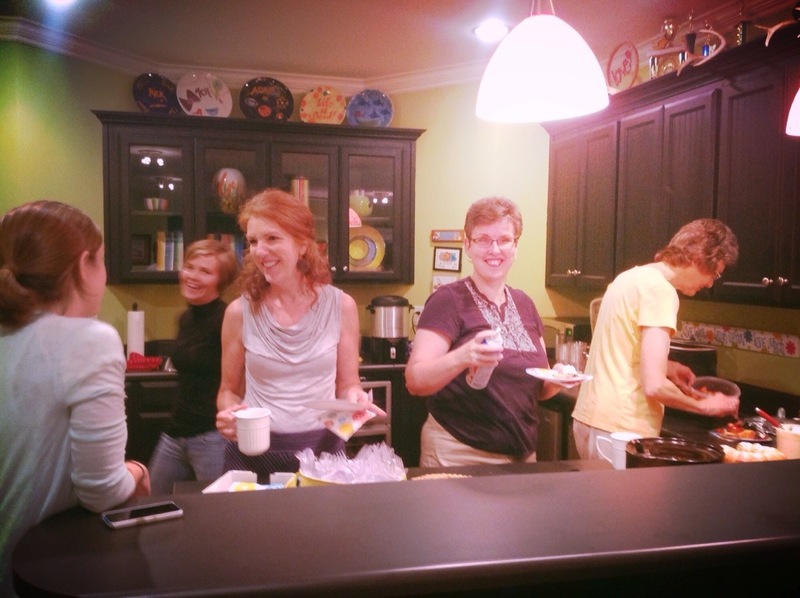 Well, a week or so ago, I invited the women of Hope Point to my house for an informal coffee and dessert. There was to be no agenda, just girls sipping coffee, eating some delicious dessert and chatting away. Can I just say, that it took every fiber of my being to not do something cutsie and have the house all “perfect”? But I did it. 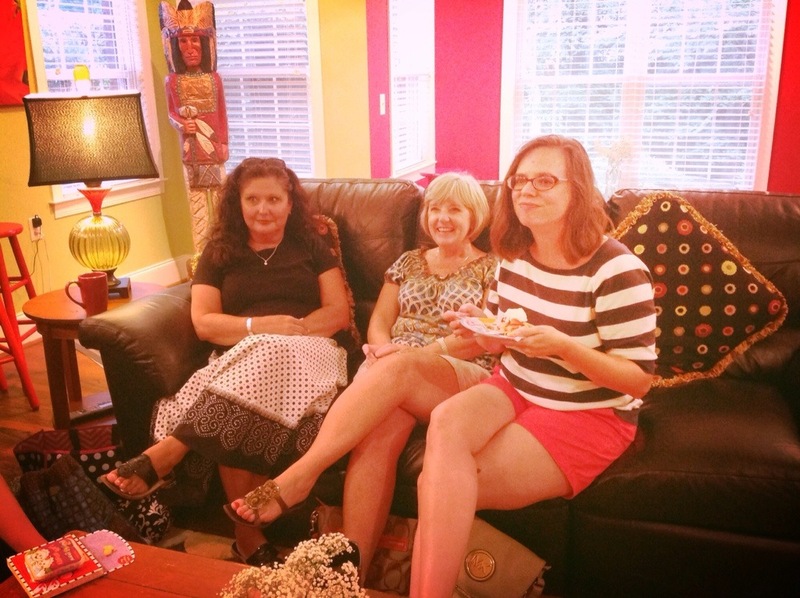 How many of us say we would love to host a get-together as soon as …we get a new couch or dining room table or rug? Or whatever? 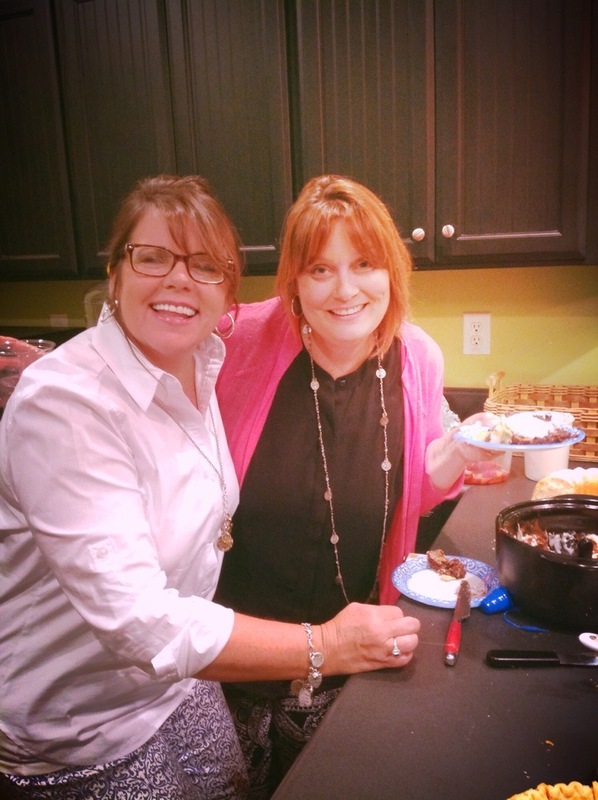 We have in our minds that we have to be Martha Stewart to welcome friends in our home. I have been in people’s homes where everything is immaculate, decorations are adorable, food is amazing, but yet the welcoming comfort is not there. I almost felt afraid to sit down. And then I have friends, that I have never stepped foot in their home! Crazy! I’ve known them for years, but have never been invited in. Both of these examples are extreme, but they are real. I pray that I fall in the middle…cute, festive and warm and welcoming. There was no RSVP, so I had no idea how many to expect. (A fact, which drives my type A-super organized-husband crazy.) 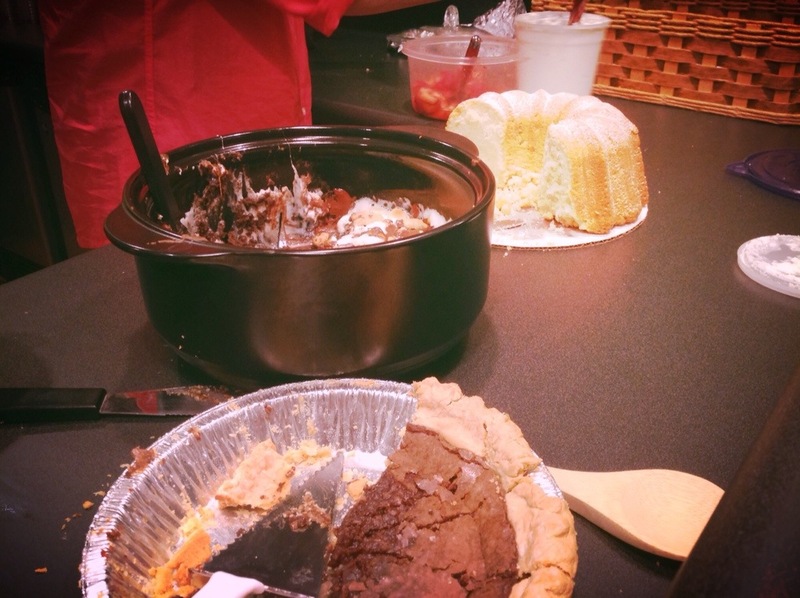 Three women came to me to say they would like to bring a dessert, so I figured there would be at least four of us! I made a big urn of coffee and had a pitcher of ice cold water with lemons. No fancy drinks, just coffee and water. And guess what? Oh my goodness! 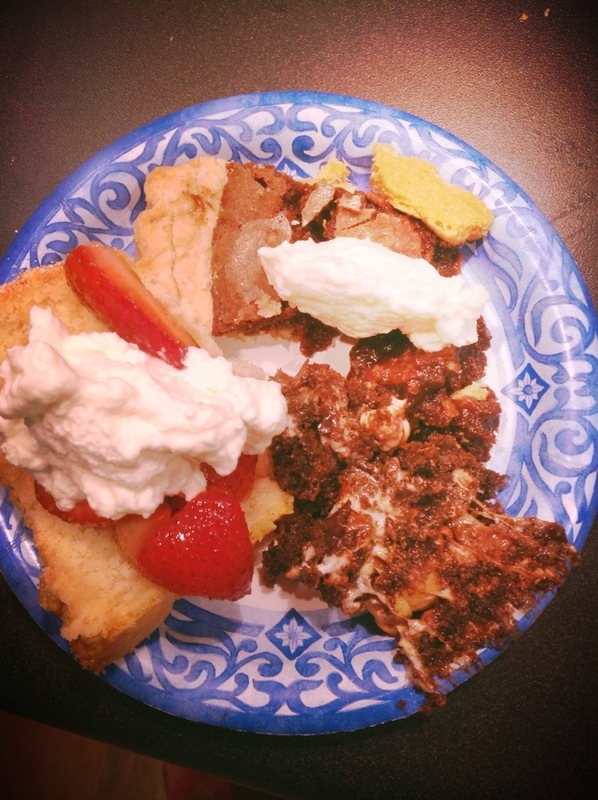 The desserts were out of this world! 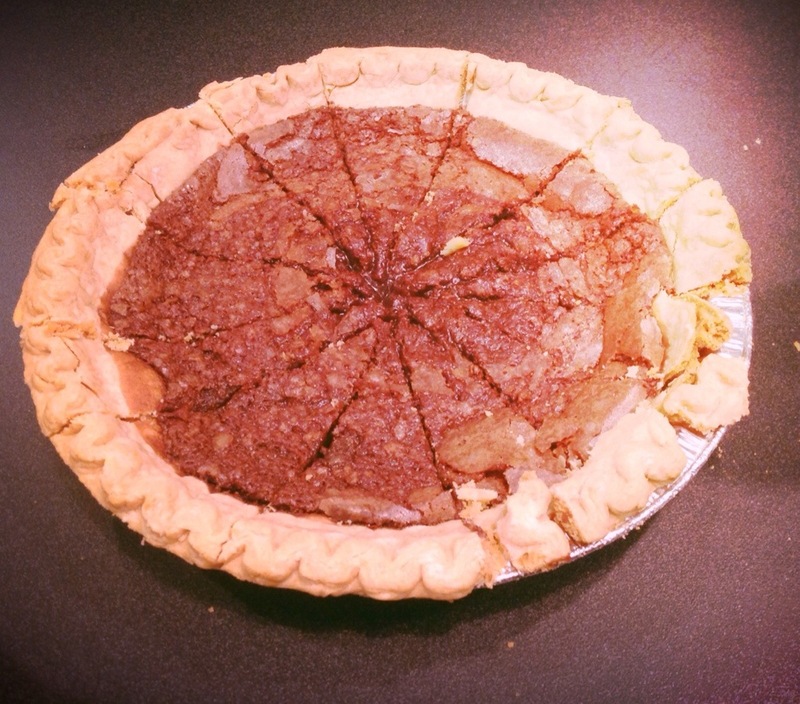 Susan brought two homemade chocolate pies, even though she wasn’t able to make it. Charlie made a deadly S’mores dessert with chocolate pudding cake on the bottom topped with marshmallows and Teddy Graham’s on top! Then to round us out, Joy brought a homemade Vanilla pound cake with fresh strawberries and homemade whipped cream. Ya’ll, I think I had died and gone to heaven! I had a little….ok, maybe a lot…of everything. It was sooo good! But not as good as the women who came! Friends caught up with one another and new friendships were made. Young and the little less young came. My word for this year is Simple. When making decisions I’ve tried to incorporate this concept of simple. It has brought me peace, time and a new view of myself. This informal gathering of friends at my house, with mismatched plates and simple offerings, created an atmosphere, I think, that was comfortable, loving and special. Friends, I pray that the idea of a simple gathering encourages you to open your home. Sparkles are nice, but your warm smile will light up your guests’ hearts for much longer.